Technavio lead analysts Amrita Choudhury and Deepthi Harimon who specialize in automatic identification system research, recently had the chance to speak with Mark Clifton, president of SRI International’s products and solutions division and vice president of SRI International. If you’re not familiar with SRI International’s name, you are unquestionably aware of the products they’ve been involved with. These products include the first two nodes of the internet, the first LCD monitor screen, the first computer mouse, and they developed SIRI, which they licensed to Apple. Their SRI Identity solutions (a branch of SRI International) are now addressing the general professional security market and have already established themselves as a major player in the global iris recognition market. This is a booming market which Technavio forecasts will grow over USD 3 billion by 2020 at a CAGR of 21.45%. SRI Identity has recently expanded its iris recognition portfolio, announcing an exclusive license of it Iris on the Move® (IOM) technologies to Samsung for use in Samsung mobile products. They are currently working on the Samsung Galaxy Tab Pro 8.4 tablet which has a built-in IOM iris module. Mark Clifton told Technavio that working with Samsung has enabled them to significantly drive down iris recognition costs where the price points are now competitive with fingerprint readers. This is a major breakthrough for the market. “By working with Samsung, we have been using very inexpensive cameras, where in the past very expensive cameras were needed to get quality images of the iris. Major advancements have since been made which use much less light than previous iterations of iris products,” said Clifton. Iris recognition is already starting to move to the mobile phone market as models such as the Fujitsu NX F-04G and the Microsoft 950 XL are already equipped with iris authentication technology. This is a path that Clifton thinks is likely to continue. Touch ID has established itself as the norm for smartphones, however, fingerprint scanning isn’t for everybody. “Some people don’t like using the finger print method and iris recognition accuracy is unsurpassed, providing a significant advantage as far as performance. As long as prices aren’t substantially higher than other biometric modalities, adoption should happen,” says Clifton. Who are the major end users for iris recognition? Clifton highlighted that one of the major end users of this market was the healthcare industry, especially in the United States. Each year there is a significant amount of misidentification of patients, people checking into a doctor’s office, and other factors which lead to various cases of fraud. Higher adoption of iris recognition technology in the market could help fraud prevention. Technavio research supports Clifton’s views. 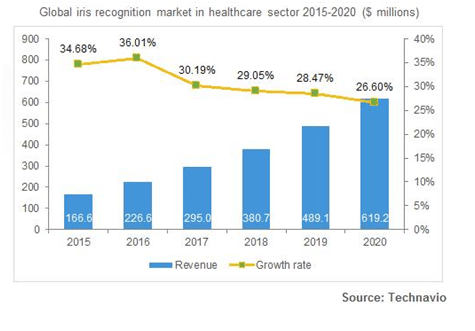 According to Technavio’s recent global iris recognition 2016-2020 report, the healthcare sector is the fastest growing segment and is expected to reach nearly USD 620 million by 2020. In addition to healthcare fraud, iris recognition technology is gaining acceptance in the healthcare sector as an alternative to ID cards that track the time and attendance of employees and eliminate instances of borrowing swipe cards to gain access to controlled areas. Which countries do you see maximum traction for this technology as whole? Clifton told Technavio analysts that SRI Identity has upcoming deployments in the Dubai airport and believes the market in the Middle East has strong potential because of its uses for border and immigration control. The company also partners with a large construction company in the Middle East who use the technology for time and attendance. “Construction workers clock in and out with their eyes because their hands are dirty and wear hardhats which can obscure their face (for facial recognition). Iris recognition is the perfect application for this industry and others such as mining and food processing plants,” says Clifton. Once again, Technavio’s research supports Clifton’s vision. Technavio predicts the iris recognition market in MEA (Middle East and Africa) to grow at a whopping CAGR of 22.86% during 2016-2020. Saudi Arabia, UAE, and Turkey will be the leading countries adopting this technology during the forecast period. Do eye safety concerns present a challenge for market growth? Iris recognition technology certainly hasn’t damaged the eye sight of Yadier Molina or Aledmys Diaz of the St. Louis Cardinals, who both rank among the MLB’s best in batting average through the first seven weeks of the season. Last year the St. Louis Cardinals became the first MLB team to use iris biometrics for security and chose SRI’s Iris on the Move technology. As for safety concerns, all of SRI Identity’s products are tested and approved for eye safety, in fact they are well below the eye safety limits. “As long as the products are properly explained to consumers and products are properly tested and designed, there shouldn’t be a problem,” said Clifton.